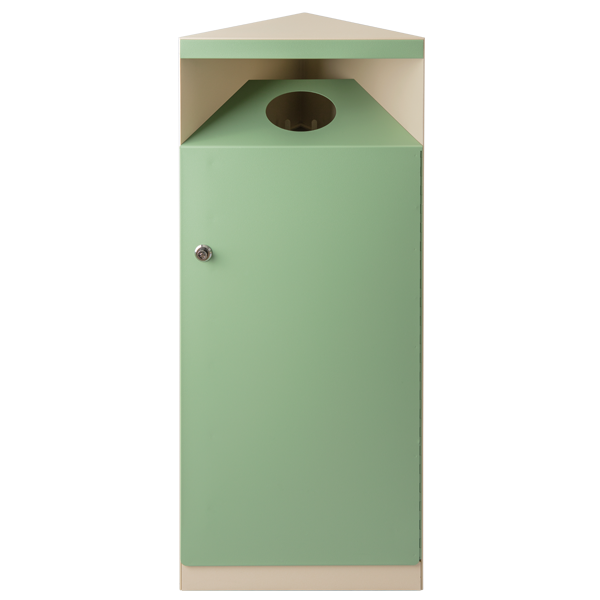 Sinus 50 litre waste bin with circular aperture for bottles, made from sturdy 3.0 mm steel, powder-coated. Internal bag holder, collection tray in the base and door with push-button lock. The triangular design of the waste bin means that it can be incorporated into the customer’s desired formation, or can stand alone. Depicted here in green and light beige, but customers also have the full RAL colour palette to play with. No surcharge for colours kept in stock. We also recommend a coating of PU film on top of the bin, which will keep the bin looking pristine for longer. We know from experience that these bins are often used as meeting tables. Surcharge for fraction labels, which we recommend for optimum recycling.